Most children look forward to mealtime. It provides a chance for them to not only fill their empty stomachs, but to socialize and bond with friends and family. Unfortunately, for some children mealtime is a stressful experience they seek to avoid due to a number of issues. 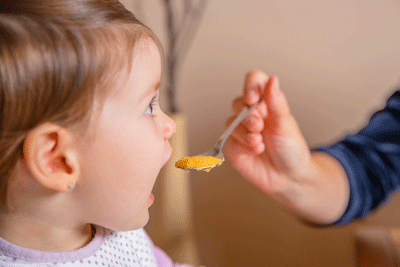 For these children, a technique known as feeding therapy can be employed to help determine why they are experiencing difficulties eating, address the issue, and then develop more effective feeding behaviors to improve the mealtime. Textured Spoons: These unique spoons have a textured bottom to provide oral-sensory stimulation and a shallow bowl to reduce the feeling of gagging. They are available in child-friendly colors and feature extended handles that allow hand-over-hand assistance from an adult. Maroon Spoons:These spoons have narrow, shallow bowls that permit food to slide off easily for children with poor lip closure, oral hypersensitivity, or tongue thrust. They are made in two sizes from a durable plastic that can withstand reflex biting. Beckman E-Z Spoons:These spoons were designed by Debra Beckman with a flat design and shallow bowl that doesn’t bump the tongue. Thick, tapered handles with slip-resistant grips help improve poor oral motor control. The material is designed to be rigid enough to handle food, but soft enough to flex. To find out more about our feeding aids, visit https://www.alimed.com/eating/feeding-aids/.